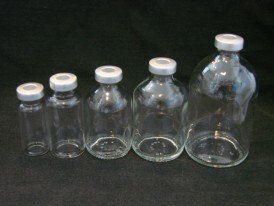 10 X 20ML Clear Glass Sealed Sterile Vials. 5 x Clear 20 ml depyrogenated and sterile vials. These sterile vials are Type 1 borosilicate assembled with butyl stoppers and colored aluminum seals, with flip top. Neck size is 20mm. Assembled units are sterile and free of all endotoxins. Ideal for analytical laboratories, compounding pharmacies, veterinarians, home use etc.